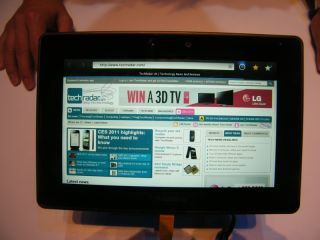 Touchscreen shortages may have caused RIM to delay the BlackBerry PlayBook launch by one month, with Apple having nabbed most of the available panel production. The rise of the tablet has led to a massive increase in demand for touch panels, causing some insiders to predict industry-wide shortages. Apple managed to snap up most production capacity at the beginning of this year, which put a spanner in RIM's schedule – although delayed software testing is also cited as a set back. Despite being announced in September 2010, the BlackBerry PlayBook is yet to go on sale – a launch event is planned for the US on 14 April. Since then, Apple has released the iPad 2, causing its usual furore at Apple Stores around the world – Apple described demand for the tablet as 'amazing'. Unfortunately we're still awaiting an official BlackBerry PlayBook UK release date, although current rumblings suggest we're looking at a June release.